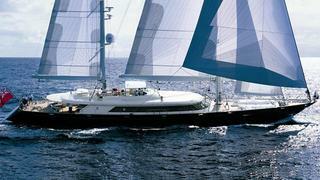 Bruce Brakenhoff Jr at Perini Navi USA sends me details of his joint listing, with Burgess, the 50m sailing yacht Perseus. Built in steel and aluminium by Perini Navi in 2001 to ABS class and MCA compliant, Perseus is, says Bruce, the best yacht in the series and offered at an extremely attractive price by a motivated seller. Accommodation is for up to 10 guests in a master suite along with a double and two twin cabins. Twin 979hp Deutz engines give Perseus a range of 3,500 nautical miles and she's asking €14.9 million.